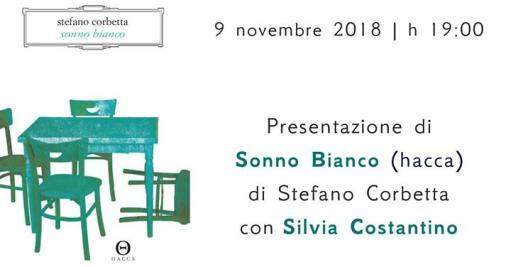 Stefano Corbetta is the author of Sleep White, a novel published by Hacca Edizioni that we will present together with Silvia Costantino on November 9th at 7pm. Emma and Bianca are identical, in the face and in the body. Inseparable. Until a terrible accident divides them and forces Bianca into a hospital bed, inside a bubble of silence and waiting. Emma will then be forced to grow up trapped in her sister's sleep: now her life is only the reflection of those dull eyes, a world made of dreams of unfulfilled dreams and intents. By now adolescent, the theater, the love story with her acting teacher and a little virtuous pianist, son of neighbors, are no longer enough to make her existence normal. Because to remind her of the guilt, there are her mother, who, having been annihilated by pain, has taken refuge in the solitude of her room to protect a secret, and a father who struggles to preserve the fragile equilibrium left. Only the notes of Beethoven and Chopin, brought by a kind and attentive boy, seem to fill the emptiness in which Emma is disappearing. But while a new method of scientific investigation tries to open a passage in Bianca's sleep, there are those who have decided to oppose that hope. In a substitution of silences and leave, everyone will have to deal with their remorse, and thus try a new beginning through the words and sounds that he will be able to keep.